¿Qué bolá Coco? 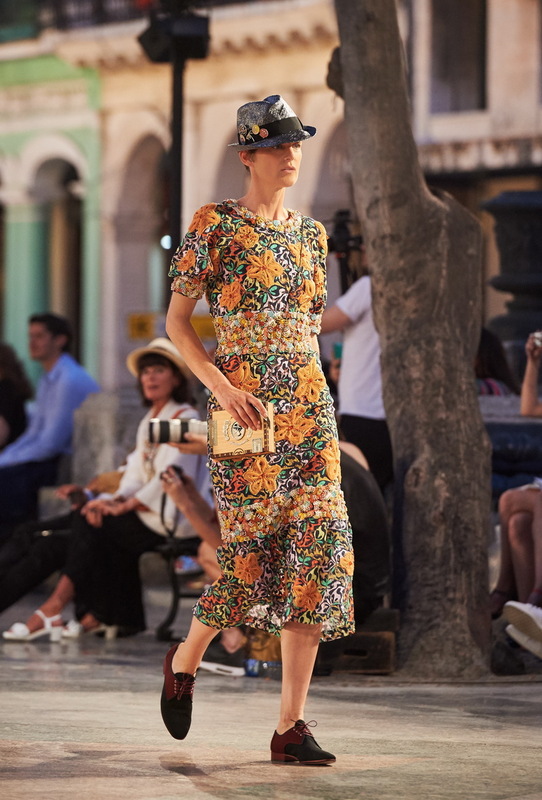 On Tuesday May 3rd 2016, Karl Lagerfeld presented the CHANEL 2016/17 Cruise collection in Havana on the island of Cuba: a historic yet playful revolution that will go down in the annals of CHANEL’s spring rites. 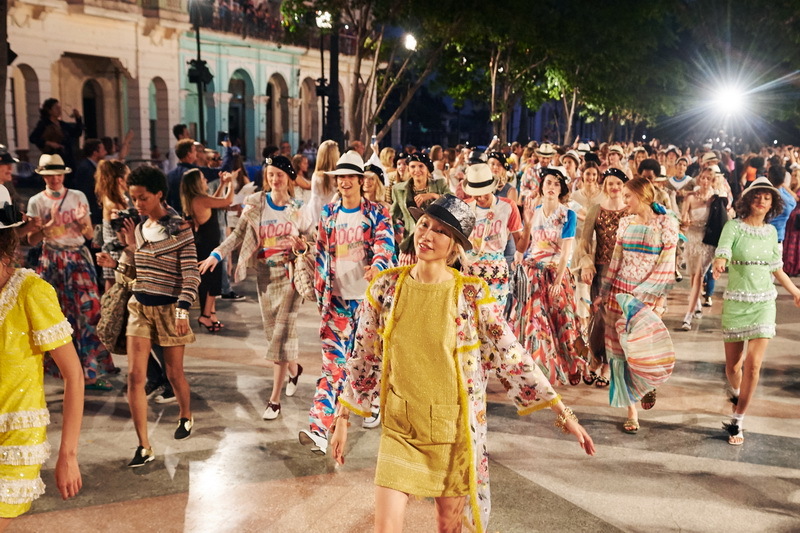 The show took place on the Paseo del Prado, Havana’s main artery and symbol of the links uniting Cuba and France: the Prado was redesigned in 1928 by a French landscape architect who at every crossroads positioned eight spectacular bronze statues of lions, Mademoiselle Chanel’s fetish animal. CHANEL thus blended humbly into this predestined décor. The setting sun haloed the watchful lions with gold; the show started with an opening passage affirming one of the major cruise silhouettes: masculine-feminine, terribly chic with a dash of scoundrel. A long masculine jacket over wide trousers with turn-ups, flat two-tone shoes, shirt belted with fabric, Panama hat by Maison Michel raffishly tilted over Stella Tennant’s haughty gaze. In this spirit of bold modernity, of boyish femininity, the “debutant dress” according to Karl Lagerfeld is jubilant: a tiered flounced petticoat in a leaf motif embroidered organza, contrasting with a mess jacket worn over a white shirt with tie. 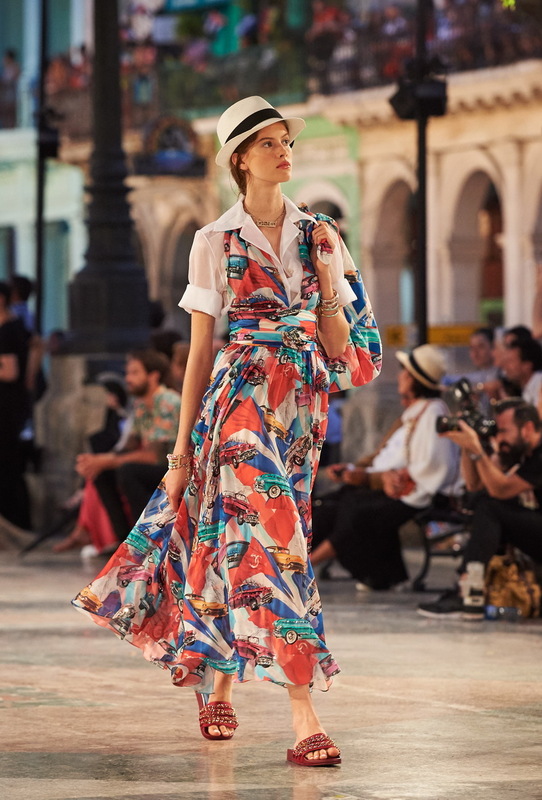 The underlying theme of the collection is a virtuoso interpretation of the guayabera, the traditional Cuban shirt with pockets, shoulder tabs and flat pleats. Karl Lagerfeld mischievously nicknames it the “Cuban tux”. For day, as a diaphanous blouse, it accompanies a pair of rolled-up chino trousers; for night, the guayabera reveals its potential for sensuality, as a black transparent organza blouse worn with a very tightly belted “sfumato” black and almond green flared skirt. A perfectly pacific military parade, with adorable shorts and jacket suits in denim and khaki tweed, a parka in fringed tweed or this short-sleeve shirt with fantasy decorations embroidered by Lesage and Montex. With the same youthful energy, the same audacity, a little pair of cycling shorts delicately rhinestoned and embroidered with camellias in “Chinese shadows” are animated by a top scintillating with multi-coloured palm trees. Incredibly feminine and fluid – in a word, dancing – the collection multiplies the number of jackets and dresses with scooped necklines while pencil skirts liberate the movement for a hypnotic rhumba, and the ethereal dresses: the legendary Buick, Oldsmobile and Cadillac feature as prints in candy shades. The palette is inspired by the vibrant baroque facades of the old town: yellow, pink, orange, turquoise, bright green burst and sparkle over the marvellous sequined and embroidered short little dresses, the chasuble-dresses in coral orange embroidered tweed. The same chromatic affirmation goes for the strapless dresses in sequins, with puffed sleeves, with fringes and feathers. The tobacco and Havana tones are reminiscent of the Cuban Picasso, Wifredo Lam. The blacks and the whites are shadowy, cloudy, smoky. The ateliers have created wonders: the “tropical vegetation” embroideries are insanely refined: great leaves of Monstera Deliciosa caught between two layers of tulle for a subtle relief effect, a quasi-abstract “cigar” motif, birds of paradise on a long dress and bolero ensemble in beige crochet is stunning in its simplicity. And always finished with a Panama hat, apart from the occasional sequinned black beret irreverently evoking “Commander” Che Guevara!